You’re invited to this 2-day workshop where you will expand your creative horizons, improve your sewing skills, and produce better results by learning to use the right tools for the sewing task at hand. 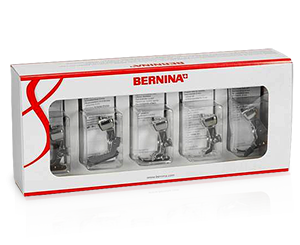 Long known for precision stitching, BERNINA offers over 75 presser feet and accessories to enrich your sewing experience, making it faster, more fun, and more professional- looking. Enjoy two days of hands-on sewing with over 20 presser feet!